Once you've created all the blocks in EQ, be sure to visit the Elf Quilt Layout page to get instructions for assembling this quilt. Remember all those trips to find the perfect Christmas tree? Look who is shopping now - SANTA! And he has brought the elves along to scour the forest for just the right tree. You can create your own Christmas Tree Forest by following these instructions step by step, or by taking a few shortcuts. It just depends on how much time you've got and whether you are ready to tackle drawing your own blocks and using EQ's Country Set. You can combine three simple 3-tree blocks for the quickest Christmas Tree Forest imaginable. You can use the many EQ blocks in the Paper Piecing - Holiday and Contemporary - Trees libraries and place them into a simple horizontal set. Again, I cheated and drew my own Santa, 3-elves and 3-trees blocks. Make yours even simpler by using just one simple tree throughout your quilt - be sure to use fancy Christmas fabrics with lots of gold or silver to dress up your trees. You can draw the blocks described in this project, but put them into a simple horizontal set instead of tackling the country set. Or, just choose your favorite of these new blocks and repeat it with different fabrics throughout the quilt. Here's a nice big picture of the quilt. To see a diagram of how the blocks are set into the quilt using the country set layout, visit the Elf Quilt Layout page. Want to see the quilt a bit bigger? 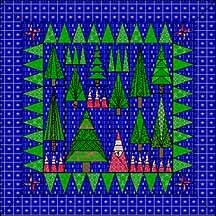 If you don't want to draw the blocks you can put trees and Santas that are already in EQ into your quilt. Drawing the Blocks in EQ3 It may seem like an overwhelming task to draw all these blocks, but don't fret - most of the blocks build on one another. This is the basic tree block. We'll draw it first, and then build other trees from it. Choose EasyDraw from the DRAW menu. Look at the Units. If your units are 60 x 60 do not change them. If your units are something other than 60 x 60, choose Drawing Board Setup from the DRAW menu and change the units to 60 x 60. Choose Add Grid Lines from the DRAW menu. Check the "Place as guides" box. To draw the bottom of tree: Draw a horizontal line from the left side to the right side on the 1st guide line from the bottom. To draw the left side of tree: Draw a line from where the bottom line meets the left side of the block to where the middle guide line meets the top of the block. Repeat that to draw the right side of tree. Repeat for right side of trunk. Three trees which radiate from the top are in the quilt. The directions here are very explicit, but as long as you create the right number of sections for each tree, you don't really have to draw them exactly as described. We'll draw the tree with 3 sections first, then build three other trees from it. You should still be in EasyDraw. Make sure units are still set to 60 x 60 and that the guide lines still are set to 6 x 6. If they are not set properly, return to Get Ready to Draw above, to review how to make these settings. Draw a line from the top of the tree to the point where the bottom of the tree crosses the first vertical guide line to the right of the middle guide line. The goal is to subdivide the sections labeled "1," above, by drawing 2 lines on the 3-Section tree. Draw your first line from the top of the tree to the point where the bottom of the tree crosses the first vertical guide line from the right of the block. Repeat on the left side of the tree. You'll divide the section labeled "2," above, into 3 sections. Draw a line from the top of the tree to a point on the right side of the tree where it crosses the 2nd vertical guide line from the right of the block. Have You Saved Your Project? If you haven't saved yet, choose SAVE AS from the PROJECTS menu and name your file! If you already have named your project, choose SAVE from the PROJECTS menu. Make sure to cross the diagonal sides of the tree so that EQ will create patches correctly for you. Make sure each line really starts exactly at the bottom center of the tree. By the time you get to the 9 patch tree, this becomes very important. If these lines don't all come to exactly the same point at the bottom of the tree, the pattern won't work well. Use the Zoom (magnifying) tool if necessary to check for accuracy. We'll draw the tree with 3 sections first, then build three other trees from it. Make sure units are still set to 60 x 60 and that the guide lines still are set to 6 x 6. If they are not set properly, return to Get Ready to Draw to review how to correct these settings. Add 2 lines to the previous tree. The goal is to subdivide the sections labeled "1,"(in the 3-Section-Up block above). Draw your first line from the bottom center of the tree to the point where the right side of the tree crosses the first vertical guide from the right. Add 2 lines to the previous tree. The goal is to divide the section labeled "2" (in the 5-Section-Up block above) into 3 sections. Draw your first line from the bottom center of the tree to a point on the right side of the tree just above the top horizontal guide line. Be sure your new line meets or crosses the diagonal tree line. Add 2 lines to the previous tree. The goal is to divide each section labeled "3" (in the 7-Section-Up block above) into 2 sections. Draw a line from the bottom center of the tree to a point on the lower right side of the tree. Be sure your new line meets or crosses the diagonal tree line. Click on Keep to put your drawing in the Sketchbook. Remember, choose SAVE from the PROJECTS menu frequently to save your hard work! The Triangle Tree builds from the Basic tree. The Polygon Tree can be created by modifying the triangle tree. Follow the directions precisely for the triangle tree, but for the polygon tree it will be hard to describe exactly where to draw the diagonal lines - so improvise. We'll start with the triangle tree and then build the polygon tree from it. Make sure units are set to 60 x 60 and that the guide lines still are set to 6 x 6. If they are not set properly, return to Get Ready to Draw to review how to correct these settings. Following the guide lines, draw 4 horizontal lines from the left side to the right side of the tree. Create triangles by drawing 2 lines from the middle of each horizontal line out to where the horizontal line below it meets the sides of the tree. To make this tree you will modify 8 lines in the Triangle Tree. The goal is to move the top of the diagonal lines of each triangle out a bit from the middle of the tree, so that the shape becomes 4-sided instead of 3-sided. Click on the Edit Line tool. Click on one of the diagonal lines inside the tree. Click and hold the top end of the line as you drag it horizontally to a new point. Repeat for all 8 diagonal lines inside the tree. Make each section progressively larger as you move down the tree. Be careful not to drop the top of the line off its original horizontal line. The 3-Elves block builds off the 3-Trees block. The directions here are very explicit, but as long as you create the right number of sections for each tree, you don't really have to draw them exactly as described. There is no rule that says all three trees or elves have to be the same exact size. Just be sure you draw all the way to the top and bottom of the block and everything will work fine. We'll start with the 3-Ttrees block and then build 3-Elves from it. Make sure units are set to 48 x 48 and that the guide lines still are set to 6 x 6. To change your units, choose Drawing Board Setup from the DRAW menu, change the Units to 48 X 48. You will draw 6 diagonal lines. Think of the vertical guidelines as being numbered 1 - 5 from the left. Start at the bottom-left of the block and draw a line to where vertical guide line 1 meets the top of the block. Draw the next line from where the last line ended to where guideline 2 meets the bottom of the block. Draw the next line from where the last line ended to where guideline 3 meets the top of the block. Start where the last line ended and draw to where guideline 4 meets the bottom of the block. Start where the last line ended and draw to where guideline 5 meets the top of the block. Start where the last line ended and draw to the bottom right corner of the block. Add 2 lines to each "tree" in the previous block. The goal is to create the face and hat for each elf. Along the middle horizontal guide line, draw a horizontal line across each "tree" to create the bottom of the elves' hats. Using the dots one step below the 2nd guide line from the bottom as your guide, draw a horizontal line from the left side of the elf to his right side. Santa Claus is wrapped in a cloak in case you have difficulty seeing him in this block. You might prefer the Santa block in EQ's Paper Piecing - Holiday library, he is pretty cute too! If you use that one, I recommend that you make the tip of his hat slightly larger so it shows up better in your quilt. Otherwise, the tip barely peaks out from behind your seamlines. Make sure that the units are still set for 48 x 48 and the guide lines are still are set to 6 x 6. If they are not set properly, return to Get Ready to Draw to review how to correct these settings. Use the center vertical guide line to guide your drawing a diagonal line from the bottom-left corner of the block to the mid-point at the top of the block. Following the middle horizontal guide, draw a horizontal line from the left side of Santa to the right side. This line should easily end on the diagonal sides of Santa. If not, be sure that your grid is set to 48 x 48 and that your diagonal lines really go exactly to the bottom corners and the mid-point of the top of the block. This creates the bottom of his face. Next, you'll need a diagonal line to create Santa's cloak. Draw a line from the bottom-right corner of the block to the point where the line you just created above crosses the left side of Santa. Be sure that both ends of the line really fall at these points. Draw the top of Santa's face by running a horizontal line about 3 dots above the bottom of his face. Be sure your line meets or extends past each side line. Draw the line that separates the cloth part of Santa's hat from the fur. Again, run a horizontal line about 3 dots above the top of Santa's face (i.e. the last line you drew). Be sure your line meets or extends past each side line. Remember, Choose SAVE from the PROJECT menu frequently to save your hard work! The Double Pinwheel block is one of my favorites to paper-piece because it looks so hard and is so easy with paper-piecing. In one of my first paper-piecing projects, I pieced sixteen 2-inch by 2-inch Double Pinwheels and they were almost all perfect! Choose the Block Library from the LIBRARY menu. Scroll to the 11th block - Double Pinwheel Whirls. Click COPY to place it in your sketchbook. Click on the (X) close button to leave the Block Library. Be sure to go to the Color Library and Fabric Library to select just the right color palette and fabrics for your project. Choose Toolbox from the COLOR menu. Choose Sketchbook from the COLOR menu. Scroll to the block you want to color first. Click the EDIT button to place it on your coloring board. Use the Paintbrush and Spraycan to color your block. Click the KEEP button each time you have block coloring that you want to save. Click on the Back or Next buttons to find the other blocks to color. Spend many happy hours getting your trees, elves and Santa colored just right. Choose Toolbox from the QUILT menu. Choose New Quilt from the QUILT menu. Choose Country Set from the dialog box. Make sure the check box next to KEEP BORDERS is unchecked. Choose Layers from the QUILT menu. Click on the Country Set tab. Change the block shape to Rectangular (double-click to get the name Rectangle in the box). Change the starting block size to 3 inch by 3 inch. Why specify a rectangular shape but a square starting size? To make it easy to elongate the blocks into tall rectangles without having to deal with the Graphic Pad to change them to rectangular first. If the Graphic Pad doesn't already appear at the bottom of your screen, choose Graphic Pad from the QUILT menu. NOTE: It is very important to get settings for both the Center Rectangle and the borders specified exactly right before beginning to design a Country Set quilt. Changes to these settings after blocks have been placed will scramble the layout. Change the size of the CENTER RECTANGLE to 18 inch horizontal by 18 inch vertical. Change the first border size to 3 inch horizontal by 3 inch vertical. Change the number of borders to 2. Ensure that the number 1 appears in the ADJUST THIS BORDER box. Click on the B button (for boxes) in the BORDER STYLE section. Slide the Horizontal scroll bar to 3 in BORDER WIDTH section. Slide the Vertical scroll bar to 3 in BORDER WIDTH section. Adjust the number in the HOR box to 3 and in the VER box to 3. Change to number 2 in the ADJUST THIS BORDER box. Click on the M button (for mitered) in the BORDER STYLE section. Click the SET tab to return to the block placement mode. Scroll through the blocks and colorings and find the tree you want to place in the top left corner. Click in the upper left corner of your quilt to place the block. Don't worry about getting it perfect, we'll adjust the size and placement in the next step. Based on the defaults we set earlier, it will automatically be placed as a 3-inch by 3-inch block. Click on the Adjust tool (top row of tools -far right). To move the block, click in the middle of it and drag to the desired position (in this case the top left corner of your layout area). To resize a block, click on it first to select it, then drag the block's lower right corner to make the block 3 inches wide by 6 inches tall. How can you tell what size your block is? Look at the Graphics Pad. The second set of numbers from the left (labeled WD and HT) display the size of the currently selected block. Resize the block, release the mouse and check these numbers - they don't change as the block is resized. Resize this block to 3 inches wide by 6 inches tall. Click the SET tool to get ready to place the next block. Remember this very important shortcut - Press the SPACEBAR on the keyboard to switch between the SET and the ADJUST tools. Continue placing blocks into the quilt. Use the picture and layout diagram to create Santa and the Elves Search for the Perfect Christmas Tree. Don't forget - save frequently. Press the KEEP button to save your quilt to the sketchbook. Choose SAVE from the PROJECT menu to save the quilt to disk. You can always use the DELETE button in the sketchbook later to delete all the intermediate versions of your quilt. BORDERS -- Remember: the outer ring of blocks are the border, not part of the country set center. Blocks placed in the borders will automatically be sized to fit the dimensions specified for the borders. To place the border corner blocks quickly, select the Double Pinwheel block, hold down the CONTROL key and click in one of the corners. To place the border tree blocks quickly, select the 3-Trees block, hold down the CONTROL key and click in one of the border boxes. The best way to print patterns for a country set quilt is to print directly from the quilt screen using the Actual Size option. The first step before printing is to SAVE, SAVE, SAVE your project. Printers can sometimes freeze the computer and there is no way to save the file once that happens. Be prepared, not sorry! Select the Pointer tool from the toolbox (the upward pointing arrow on the top left of the toolbar). Click on the block to be printed. Choose PRINT from the PROJECTS menu. In the Finished Block Size section, make sure the box labeled Actual Size is checked. This causes EQ to ignore the other size settings and use the actual ones from the currently selected block. Make sure the boxes labeled Print Numbers and Seam Allowances are checked. There is no reason in these designs to select the Mirror image option. In the Number section check the box labeled As many as fit. In the Copies specify the number of copies desired, by pressing the up arrow button. TIP: Rather than printing each block as many times as it is needed, stitch-trace the pattern onto a stack of tracing paper using an unthreaded sewing machine. This creates easy to see-through patterns that are easy to tear away. Click the Print button to begin printing. Be sure your printer is turned on before you do this! Repeat these steps until all desired blocks are printed. Use medium weight, flexible tracing paper. If it is too thin - it will tear while you try to construct the block. If it is too thick - it will be harder to work with. For blocks that have more than one section (such as the Double Pinwheel), be sure to trace two block copies per block. Sew each section onto a separate sheet of tracing paper and then join the sections. Use a size 14/90 needle and 8 - 10 stitches per inch to do your stitch tracing. Unthread your machine and stitch along every line including the outside cutting line. Be precise - this is your pattern! The tree trunk sections could be mass assembled by strip piecing methods. Cut strips of background fabric 3 inches wide. Cut tree trunk fabric into a 2 inch strip. Sew together with the trunk fabric in the middle. Iron. Cut as needed about 1 inch larger than the trunk section where it will be used. Sew to bottom of tree after tree top is constructed. The elves can be created from rectangles cut from strip-pieced fabric. Cut the hat fabric into a 3 inch strip, the face fabric into a 1.5 inch strip and the body fabric into a 3 inch strip. Sew together with the face fabric in the middle. Iron. Sub-cut into 2 inch rectangles. Now for the tricky part - using these elf strips in the paper-pieced pattern. Cut into 2.5 inch rectangles. When sewing them into the pattern, tilt the rectangle-strip set as it is sewn in. Don't worry that the faces will be at an angle, that will be much cuter than all those straight lines in the original picture! A potential problem turns into a creative solution. To create a nicer paper-piecing pattern for the borders, redraw the block on its side. That way it can be printed out in one section on a single sheet of paper. To eliminate the seam between the border blocks, tape 3 traced patterns together before stitching.